Back in April I blogged about wanting to get an e-Reader, but not knowing which one to get. Well, today I finally made my choice and I ordered a Kindle from Amazon. 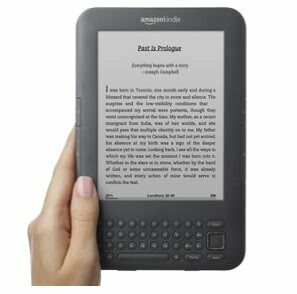 After doing lots of research about the different readers out there I decided to go with the Kindle, despite my dislike for Amazon and some of their practices. But if I am going to invest in something like this then it has to be the best. And it is. And with the price drop it made it even more affordable so it's now on it's way. Well, once the new stock arrives that is! I am so excited and can't wait to get it and try it out. I really hope it lives up to my expectations. It weighs less than 300 grams and has free 3G wireless so you can download books anywhere without having to get a phone or data plan from a telco or anything like that. The list of cool stuff is endless, so I'll let you read all about it for yourself, if you're interested, here. This will in no way stop me from buying books, there are some authors and books that just have to be physically bought, but it will save me heaps of money (and space) buying the cheap fiction that I often pick up, stuff from Reichs, Patterson, Slaughter, etc. Plus you can get older books for under $5 and there are also out-of-copyright books you can get for free, which suits me, as there are a few of those 'classics' I've always wanted to read, but never actually wanted to spend money on in case I didn't like em. Such as Jane Austen! So what do you think? 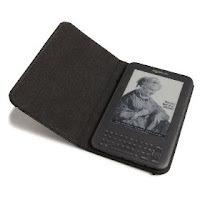 Have you been tempted to get an e-Reader? I havent been tempted to get one (yet ) and even if i was tempted i couldnt afford it anyway. But wait - you havent read any Austen? !